A lot of things have changed in the last two years at Colette. 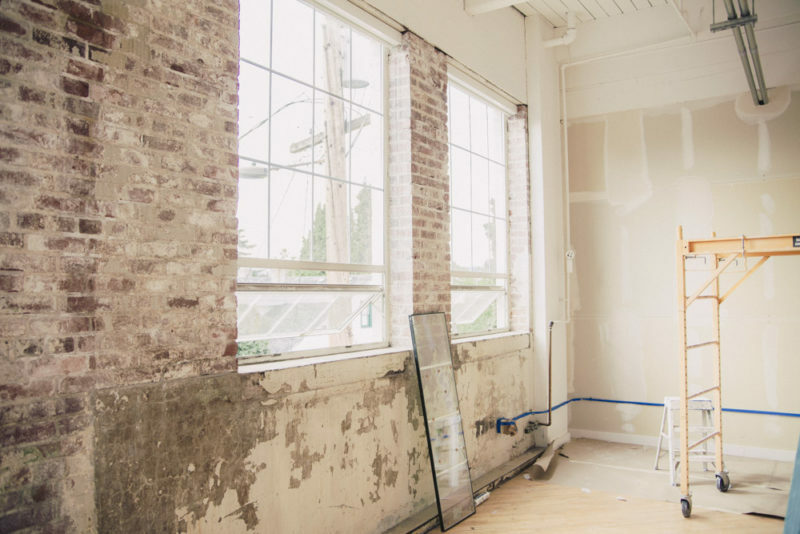 Nearly two years ago, in October of 2014, we moved from our 1100 square foot studio (which I never thought we’d outgrow) into the 2300 square foot studio we now reside in. We’d just hired our second employee, Meg. 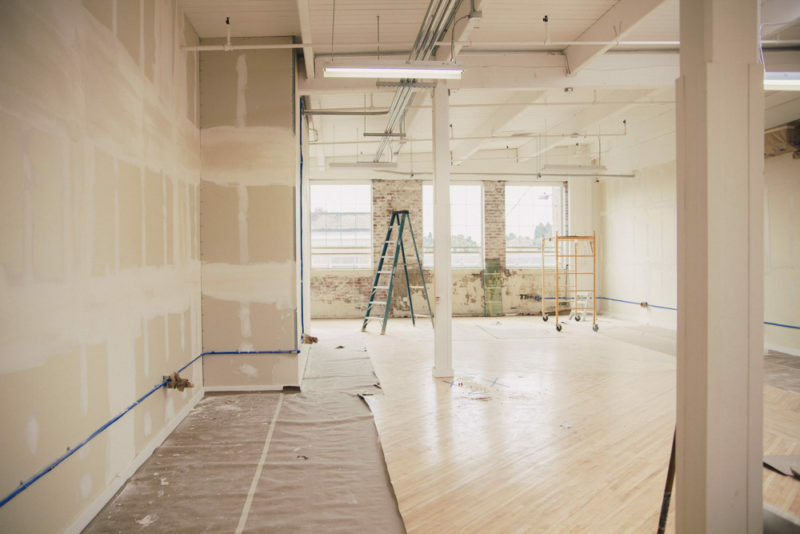 As we started moving in, a visitor to our brand new empty studio laughed at the upgrade in size and asked if we were planning to hire 10 more people. I laughed along with him, secretly embarrassed and anxious that I was getting in over my head. I didn’t know what was coming or how we’d grow, but something told me we’d need this space. Fast forward to today, and we’ve grown to an amazing team of 11 people (including me and Kenn). These are the most creative, dedicated, caring, fun people I’ve ever worked with. I am totally privileged and proud to have them with me every day. There have also been a lot of adjustments. I’ve had to learn some skills in a hurry. I’ve had to get over some fears. I’ve had to get comfortable with calculated risk, and how it affects others. And one of the biggest changes I’ve encountered is learning to find a voice and creative a vision as a team, rather than an individual. In the past, I could follow my own creative whims and preferences, for better or worse; today, I have really smart and talented people around who influence me with their own perspectives and specialties, whether that’s Meg who is so in touch with our customers, Taylor who creates our photo shoots, Anna who designs, Wallis who drafts patterns, or anyone else here. Everyone’s perspective feeds into what we create together. On the other side of it, there’s my responsibility to find that core of what makes Colette tick, and make sure that’s translated through everyone else’s work. This is where the biggest learning curve has been for me. At times, we’ve struggled to understand what exactly we were trying to say, where our designs were going, what was most important to our customers. The hardest part was merging these together. People buy beginner patterns like hotcakes, yes. But is that all we want to be? Is that what drives who we are? This is the problem I’ve been dedicated to for the last several months. We started some initiatives to keep better tabs on what our customers are making and loving. We conducted a massive survey of thousands of people. We talked to lots of indie shop owners about what they see. From all of this information, we created some design tools to really narrow our focus. Basics are easy to come by these days, and many of them are great. Where Colette has traditionally shined has been in the pretty, the interesting, the special details. Classic doesn’t have to be boring. It can also be vibrant and fun. Nice wardrobe staples are also great, and that’s where we want Seamwork to shine. But as sewists, we also want to make things that just make us happy when we put them on. (I’ve always called these my “compliment dresses” because they’re the things people stop me and comment on in the grocery store or wherever). In the next pattern, you’ll start to see this shift back towards the beautiful and special and fun. You’ll see the vintage inspiration play out in interesting design lines, feminine fit, and pretty details. These themes are going to carry through all the designs we have planned for the rest of 2016 and 2017 for Colette. I can tell you, we have been having a LOT of fun planning these new patterns, and the whole team is excited to share these beauties we have in the pipeline (and to sew them and make them our own too). Next week, I’m going to share more specifics of our creative and design process and how it’s changed this year, if you’re interested in the nitty gritty. Yes! Yes yes yes:). So glad to read this! After automatically buying every pattern that came out, and enjoying the two knit dresses, I didn’t get Selene or Phoebe – and haven’t used Aster, even though my initial plan was to add waist tucks – I am so happy to see the new mood board and can’t wait for Colette to return to its roots! Woohoo! Sarai, this summarises exactly why I am a Colette fan for years. I am past beginner patterns, and love your patterns for the good fit as well as details in the pattern design itself – gathers replacing darts, flattering waistlines and sleeves, you know what works on women. I look forward to seeing what is next! Can’t wait to see the next pattern, because I LOVE everything on that mood board. I do love Seamwork, but have been feeling lately like the closet is getting stuffed and maybe I need to slow down and do some “higher skill” makes – both to try new things as well as to get those ‘compliment’ dresses. Honestly, I wear both types of pieces a lot and the best rhythm I’ve found is alternating easy wardrobe-filling projects with fancier, more striking projects. It keeps my sewing fun, interesting, and rewarding at the same time. These kind of posts are what I love reading. It’s difficult to shift from a one person thing into a company while still being as transparent as possible. Also sharing the process and not just the”shiny” is what makes you so “personal” while still being the biggest indie pattern company out there. The low prices of Seamwork patterns concern me though. I want to know that the patterns I buy are produced by people with fair working conditions, just as I want the same thing from every other product I buy. The prices of these patterns are way below the average for indie ones, even the simpler patterns. The low price of the Seamwork patterns can be explained by the simplicity of their design. Not a lot of moving parts or pattern pieces, based on previous work. A nicer way of saying that is: Collette has enough designs in the bank where they can simplify and reuse them in a new way. Upcycling for patterns? Why not? You can borrow from yourself as long as you ask permission. So happy to read this news! I have been a huge fan of Colette from the beginning and the early designs are definitely my favourites (with the exception of Selene!) Can’t wait to see what you’ve come up with! Hooray! So glad to hear that. I’ve barely bought any indie patterns lately because they all seem to be basic, boxy, plain beginner clothes and I want something detailed and challenging to really get my teeth into. Seamwork patterns are great as a quick palate cleanser but I prefer to take time over a major project and have something truly special at the end of it. So glad to hear you’re going back to beautiful, detailed, special fun dresses! Thanks for listening to your customers! Yay!! I’m very excited about this. I would make/wear everything on that mood board. The early Colette patterns are the patterns I learned to sew with and are still some of my favorites. This is what I loved about Colette! I was especially drawn to your earlier patterns – so feminine, fitted, unique, with a vintage appeal; you truly made unique patterns. I am looking forward to your upcoming creations! I’m very happy to hear this. I remember reading that in the beginning you were designing to fill out holes in your catalog. So, there were slim pants, wide leg pants, a couple blouses, a couple skirts, quite a few dresses, a coat, and a jacket. Then you created Seamwork and now you have a collection of basics. So yes, I would love to see some frosting in the 40s, 50s, & 60s silhouettes you used to explore. And I realize that producing more complicated patterns doesn’t always lead to sales. I always find it interesting when pattern companies release a list of best sellers and they’re all beginner patterns. But I’m hoping with Seamwork covering beginner basics that Colette can again produce visually interesting intermediate patterns. I’ve seen everything you’ve done from the beginning to present and it’s exciting to see the transformation. I will always have preference for your patterns, designs, aesthetic, and styling over all the other indie pattern companies. Great job and keep at it! What a wonderful story, thank you so much for sharing your journey with those of us who appreciate Colette and it’s impact. As a new business owner, I also struggle with this narrative & branding dilemma. Sometimes it feels so inauthentic to pin down “what my business is” when there are so many directions to go in. I’m so excited to see what you lovely people do next. I’ve so enjoyed your company’s evolution on a personal (sewing) level. Lovely as always. 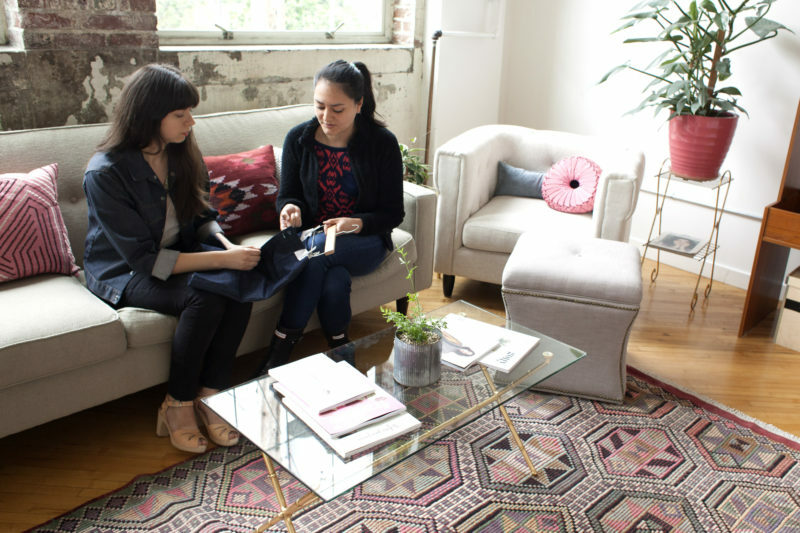 1) I love everything Colette and Sarai 2) I really hope your new more complicated patterns will inspire local shops to have classes beyond the basic levels! I would love to take a full day intricate Colette dress-making workshop! This is great news and if the mood board is anything to go by, I’ll definitely be buying the new patterns. This is great news, and wonderful to read. I always value the vision and clarity of Colette as a brand. Those pretty dresses are exciting, as well as the Seamwork wardrobe staples! Oh, and I’m VERY excited about the idea of layered PDFs for downloaded patterns, to only print particular sizes! I am really excited to see what the future holds! 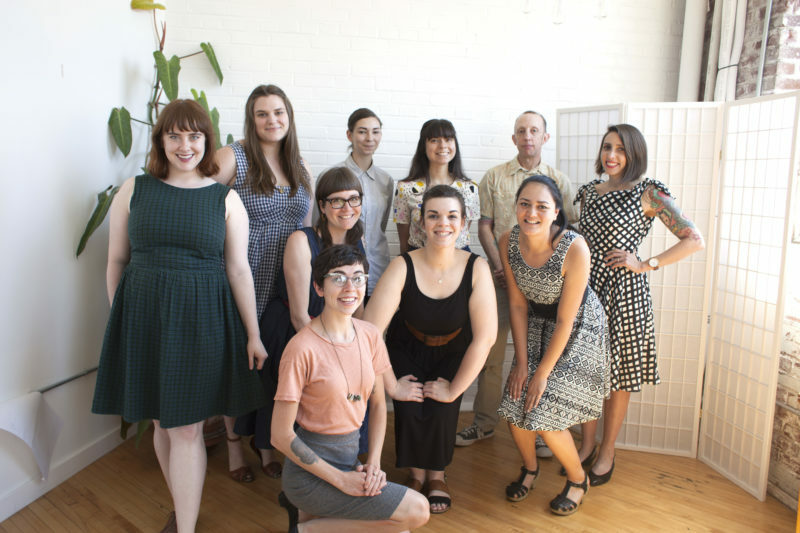 I was attracted to CP because of the pretty details, vintage styling, and the opportunity to learn technical sewing skills– and while I see the value and importance of Seamwork in the companies repertoire, I’m happy to hear we’ll get to see more of my sewing loves. Three cheers for bringing in beginners, and three more for helping them/us grow our sewing game. Pretty and feminine! Yay. Can we get some princess seam dresses? Empire waists? Sewing as very petite, flattering styles can be hard to find. Yes! I am so excited by that mood board! I know there’s a place for basics, but they don’t interest me at all. I want interesting details and pretty dresses! I can’t tell you how happy this blog post makes me. I am bored with shapeless beginner patterns and t-shirt. As a non-beginner who loves “interesting design lines, feminine fit, and pretty details” I truly lamented your change of direction. Love the mood board and I’m excited for vintage inspired patterns that will make me happy again. I love hearing a little bit about behind the scenes!! I can see the thought & work that goes into it all. I have LOVed the Seamwork initiative that you started & look forward to all the new stuff to come! Thrilled to read this Sarai, and I hope to become a customer again. I look forward to seeing some designs which will challenge and produce stylish pieces. As a mature sewist, I look for clothing which is feminine without being skintight and stylish without being a costume. “Feminine without being skintight, and stylish without being a costume” VERY well said!! As a fellow mature sewist, I’ve made requests for help with modifying patterns to make them warmer or more modest (raise necklines, add sleeves), and although there was plenty of support for that kind of fitting help in the comments from those of us who consider ourselves “mature”, it wasn’t forthcoming. I continue to acknowledge that no company can please everyone every time, but I do hope that the trailblazing in diversity that this company has done will someday include modesty/warmth options. I’ve never understood why a woman should be expected to have most of her chest bare, or wear something sleeveless, when the men around her are wearing long johns and flannel shirts! For whatever it is worth, I’m truly looking forward to the return to the attention to detail that made this company so wonderful in the beginning, and to being a customer “again”, as Mary said. It’s been incredible to come with you (Sarai + Colette Patterns) on this journey. This new direction is exciting and I agree, I think everything you’re focusing on now is Colette’s core distinguisher (or whatever the business term is). Looking forward to future patterns (and company directions)! That’s good to hear. And I hope that as a result of this change there will be more attention given to precise and accurate drafting. One of the reasons I have passed on a number of patterns is because of all the reported problems. I would also hope to see sample garments made up for Seamwork that are well fitting and properly pressed. When a so-called expert is putting their work out there, they should make sure that their work is exemplary and not mediocre in appearance or execution. Thank you to make me dream everyday. You are official my favorite patterns’ brand, i dream to be a part of your team . It makes me feel like the perfect job sleeps somewhere ?. Of you need a marketing range manager I would be the happiest in the world. Thanks you for your amazing work!!!!!!! I am, by all accounts, a beginner (though I suppose an advanced one at this point) and I must say it really delights me to think you’ll be going back to more complex patterns, because those are the ones I prefer in your shop. I’m thrilled by this! I have every single pattern except Phoebe, and do you know what I reach for constantly? And get compliments on every time I wear it? The Ceylon. I can’t wait to see what’s next! I agree with all the comments in this post. Really looking forward to the new patterns. It has been wonderful watching Colette grow and mature. It seems to be one of those special places where things and people just mesh ! I am not a curvey girl, so frequently the patterns are not for me, but I love Colette and Seamwork ! Keep up the good work, and best wishes for the future! I love the mood board and hope that your patterns and the accompanying photo shoots are more feminine and classic going forward to mirror this mood board (I see high heels in those photos, yay!). A lot of the past photo shoots have obviously captured a more “Portland” style sensibility but it would be nice to see a different look on the next few patterns. Maybe you can style the outfits with more than one look if you must stick to your brand’s core style. Love the poppy dress! After many years in SF Bay area I now live in Montana and find myself living in old Levis much of the time. I would love a pattern for this dress. so excited to see what’s coming! Great news! This is a lovely post; your discussion and appreciation of the varied people and parts of your business development is fascinating and honest. 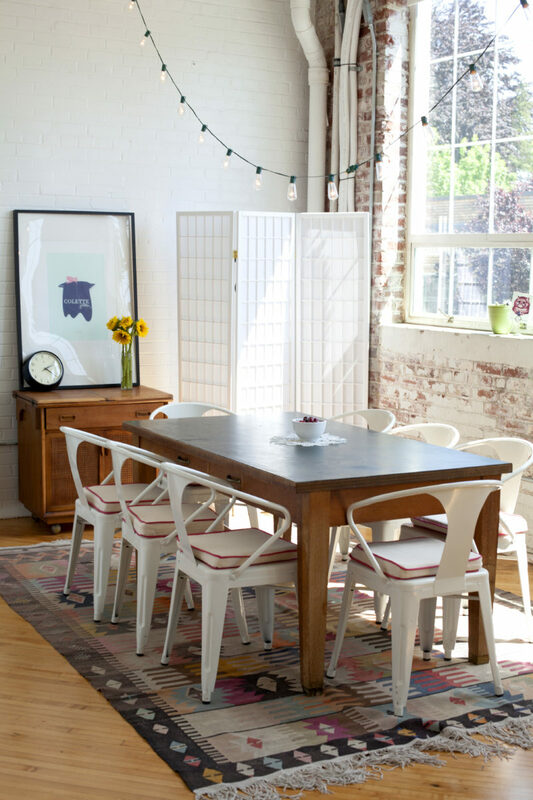 The pictures of your work space leave me wistful and wanting to revamp my whole house–and my workspace–though I’m a teacher and school starts again on Monday! Longing aside, I have hugely appreciated your team’s guidance this summer via tutorials and links, and I’m interested in what comes next for you! Sarai and the team, what can I say??! After reading this article and seeing that mood board, I suddenly forgot all about my ‘savings’ and got back to why I LOVE you guys and all you stand for! I’ve successfully reinstated my subscription! YAY!! PS. Keep some beginners patterns coming, I’m still trying to catch up!! Yes please keep the simple and elegant seeing also– if not for the quick down and done patterns I would never get to see anything! Exciting. Enjoyed reading about your process and growth. I discovered Colette and Seamwork at the beginning of this year and I cannot even explained the difference it made in my life. I live in South Africa where sewing patterns – but not fabrics thanks to a large Indian community – are rather uninspiring. Thanks to your site and publication, I feel so inspired to create a beautiful wardrobe that reflects my own tastes. However, could you please consider including metric measurements on your products as most European and African use this system. I feel very lucky that I came back to sewing and soon found Colette patterns. I have tried other patterns from the big companies and the results have been inconsistent for me. I really feel that I learn when I make a Colette pattern:not only techniques but that I have narrower shoulders than I thought (Dahlia neckline gathering), I don’t need a full belly adjustment in my Clover capris, I LOVE the Hazel dress in needlecord as I feel like I’m being hugged when I wear it. I am typing this wearing one of my 9 Sorbetto tops – each one slightly different from the last. Watching a documentary on Matisse, he did not make great art the first time he did something but if you repeat/cut out a shape enough times, it may make great art. Thank you all and keep doing what you do. I will be following along, for sure. Oh! I do LOVE that mood board! I’ve always wished for the vintage flavor in larger sized patterns. I was wondering if maybe you were considering a bigger size range? Like maybe adding size 28? I am terrified of making adjustments to patterns, so I just keep buying and hording everything I can find near my measurements. I will soon be making the plunge on one of the knit dress you have, since knit is more forgiving than woven. At least I have your pattern as the base. Thank you so much for offering stylish patterns in bigger sizes! Meg has been with us almost two years, and she is amazing!!! I’ve been a follower of Colette patterns since 2011. I’ve learned quite a bit from the books, patterns, sewalongs, blog and other materials you provide. I’m looking forward to the new pattern. The Seamwork patterns are great but I feel like the focus has been there for too long with not enough challenge. When Colette first started there weren’t a lot of independent pattern makers on the market and now there’s a lot of competition with many basic patterns that seem identical. Colette can really shine with more advanced patterns. I am very happy to hear about the design shift. While I really like the wardrobe basics from Seamwork, my taste tends toward the more feminine designs shown on the mood board. I can’t wait to see the new pattern! . And I too would like to see older models with varied body shapes as this will give me some insight on how a pattern will work for me. . So excited about all of this. My request would be that Seamwork patterns are also offered in “hard copy” to order, instead of printing out myself. Love Colette. Cannot wait for another pattern. I think that given the Seamwork patterns are…ehm…high-volume products in comparison to Colette patterns (that’s not the right word, but I can’t think of a better way of phrasing it! ), hard-copy patterns of both might be a logistical pain. 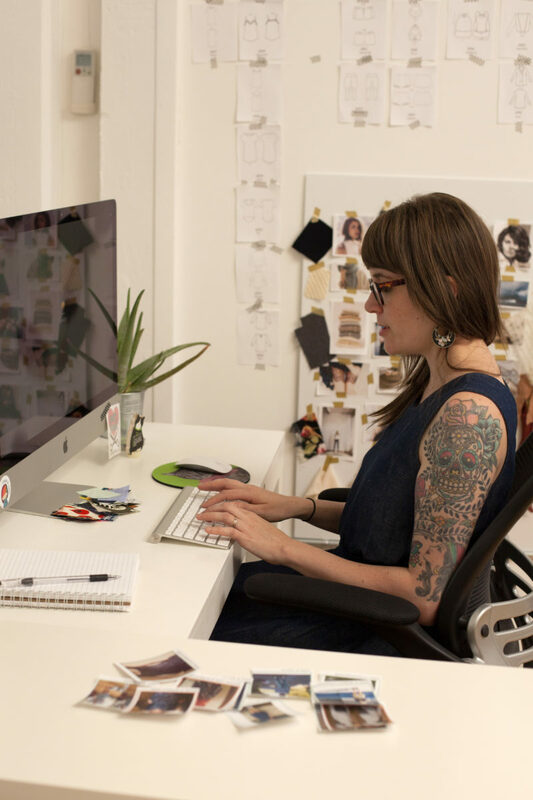 However, a print-on-demand service for Seamwork patterns might be cool! Another over 60 sewist here. . I agree not all of the “young” patterns can be sewn or hacked to fit my needs and desires. I second the request for a diversity shift or expansion in our direction. Looking forward to more challenging choices as well. Feeling happy for your company’s successes. You write beautifully :) Always a fan, have many of your patterns but honestly have never sewn a thing for myself! My 3 year old granddaughter, wears bespoke couture every day of her life,LOL! I found that the items in “Seamwork” although lovely, didn’t have enough appeal for me to even consider making, not sure why. I LOVE the plans for you fresh-direction and God knows there are enough “quick and easy” things to sew out there. I for one would truly enjoy the updated classics with beautiful construction and fit, THIS is what is lacking IMHO in ready to wear. Wishing you good things to come and I may just indulge for myself yet! I would like to be a pattern insider. I love your patterns and I have sew a lot of them, colette patterns and especially seamworks patterns. I live in France and I can promote them in my country. One of the things that I appreciate about Colette patterns are the well written instructions with additional photos online in the sewalongs. While I am a more experienced sewist, I made sleeve plackets for the first time using Aster. The instructions were clear and the end product lovely. That to me is key in the process. The patterns themselves are one thing–the lucidity of the instructions another. I hope this will include beautiful and inspiring tops. I am unfortunately not someone who wears dresses and am always on the search for interesting tops and blouses (for large busted women). I really hope your creative vision includes “separates” people like me. I have been a subscriber to Seamworks from the beginning and love what you are doing. I really support your vision and want to be a part of it! This is all so very exciting! I’m really excited to see what you (all) will bring to my inbox! I am newer to the Colette community. Almost done with my Crepe dress (fully lined and reversible) and am starting on Macaroon with plans for a few Aster tops and a Ginger skirt or two. I love the mood board you posted and can’t wait for more! As a patternmaker/technical designer in the apparel industry, I do not always *want* to draft myself a pattern, though I am completely capable. I love Colette’s design aesthetic as well as patterns drafted to a C cup. Can’t wait to see what the future holds! I am hopeful about this change, but I also have some mixed feelings. On the one hand, I feel like some of the Colette beginner patterns were too beginner for me (like the knit skirt). I enjoy sewing more complex items with stylish detail. But on the other hand, the complicated patterns hinted at here don’t really entice me as much as I had hoped. 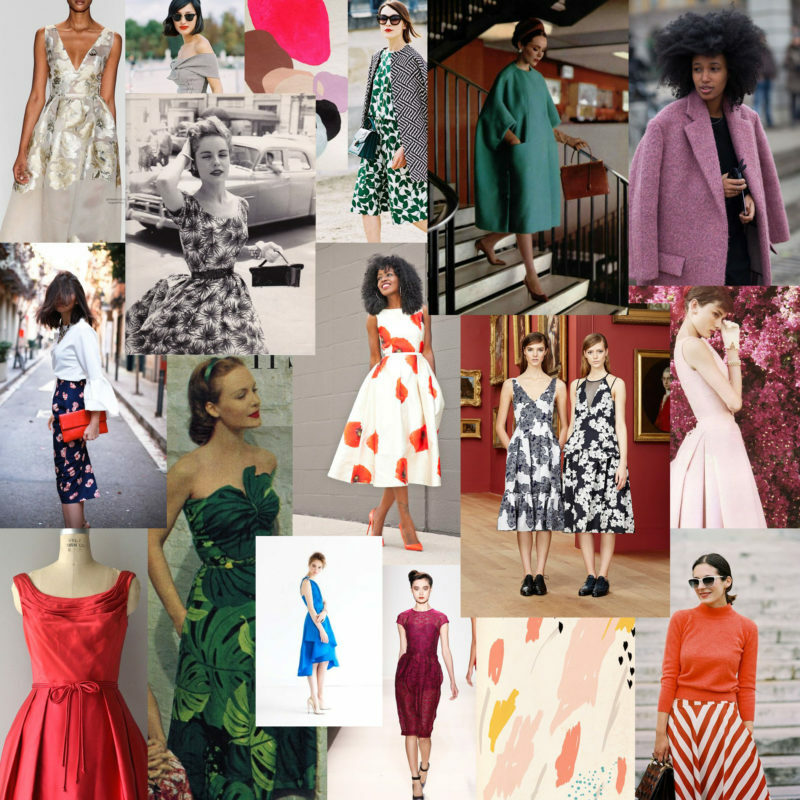 The mood board has 12 party dresses, 2 vintage coats, and 2 skirt/blouse combos. Um, I really hate to be a downer, I do, but….I don’t have a big need for pretty party dresses? I like to be pretty as much as the next girl, but outside the odd special occasion or holiday party, I just don’t wear party dresses. I’d rejoice in one or two new party dresses with delightful details, but to be honest, Colette already has several in their stable of patterns, and the mood board dresses aren’t styles I’d wear comfortably. Like some others mentioned, the necklines are low, the lines very tight. There’s a lot of complex patterns that I’d love to see Colette tackle– a stylish ladies button down, a well-drafted lingerie set for cup sizes, a pair of jeans, a pretty tunic, or if you’re going vintage, a comfortable house dress. I don’t know, I guess this just makes me feel like maybe I’m not really a ‘real’ Colette customer. I guess it’s stupid to feel left out, but there you have it. I’ll still cheer you on and hope this new direction is successful for you. I’m so excited for this shift! I love Seamworks. I love Colette. They’re very different and that’s fantastic. I’ve learned so much from both about sewing garments. Thank you to you and your staff for creating patterns that are special and not just a sack of potatoes dress! As a seamstress with fledgeling fitting skills, but who adores pretty dresses, I love every level you have to offer, from snippets to Seamwork to patterns. I love Colettes aesthetic and really appreciated this post and insight into your process, thank you and all good wishes for your refreshed vision. i love this! i’m sooooo excited to see what type of pattern that caccoon coat inspires! LOVE the mood board!! There’s at least three dresses on there that I would make and wear for sure! I love the orange and white boatneck dress and would buy a sim pattern in a sec especially with a slightly raised waist. It’s gorgeous. I also impressed with the growth of Colette and although i have fitting issues with patterns that i have yet to figure out how to adjust, Colette is my go to -always! I’m so late in this, but PLEASE, more knits! Heck, heavy cotton/spandex french terry, same contents in a fleece, interlock, liverpool, double knit, ponte, I even have a 16oz cotton/Lycra jersey!!!! All of the above mentioned can be found in cotton/Lycra, which is great for recovery. Knits can be so fun, and you CAN use darts of all kinds, plus: pleats, tucks, gathers, you name it. I’ve got fish eye darts in a woven-to-knit dress, bust darts in a knit top, waist darts, plus beautiful princess seams in knits. You guys are great and I look forward to see what’s in store! I am so happy to hear this and can’t wait to see the next pattern! To be honest, while I’ve been following Seamwork and Colette since almost the beginning, it’s been a couple of years since there was a pattern I saw and immediately thought, I MUST make that! It was your original vintage-inspired, really special dresses and skirts that originally appealed to me. And the Ginger! Can’t wait to see the reveal, and, judging by the mood board, the rest of the patterns for the season! Ginger, derp! I meant CLOVER! So excited for the new patterns! Oooh, this excites me. I loved the Macaron and the special/pretty character of early Colette patterns. And as a sidenote, for the past few years I’ve been looking for a dress pattern with a fitted bodice and wide (not quite off-the shoulder) neckline like the gorgeous eggplant dress Juliette Binoche wore in Chocolat! The necklines on your moodboard are getting my hopes up!! Very informative and meaningful. It makes me happy to see agroup of younger people who are like minded, who work together and are successful. As a struggling designer and very small business woman, I am delighted to become part of the Indie world. My one regret is that I did not find this about 40 years ago. I love sewing and creating. Keep up the good work. A hopeful suggestion – could you have (optional) sleeves in most of (all of!) your tops and dresses? My arms are not aesthetically pleasing without some covering! You are such an inspiration! Love the way Colette has grown up and looking forward for upcoming! All the best to you and your team! Keep going!